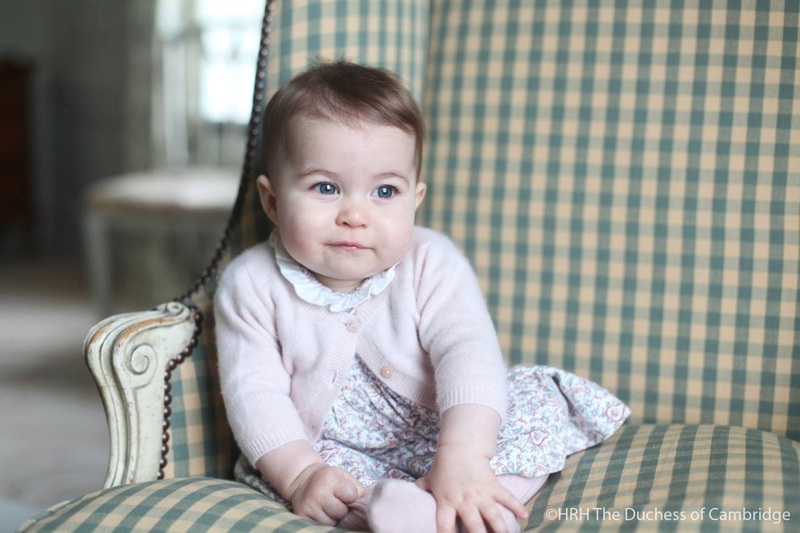 Tomorrow, Princess Charlotte Elizabeth Diana will celebrate her first birthday! Kensington Palace released four beautiful photographs to mark the occasion. The Palace said: "The Duke and Duchess are happy to be able to share these family moments, ahead of their daughter's first birthday. We hope that everyone enjoys these lovely photos as much as we do." The official portraits were taken by her mother, the Duchess of Cambridge. Kate snapped the photos at their country home, Anmer Hall. The Duchess is a passionate photographer, and this is the third set of official photos she has taken of her children. The first was when Charlotte was only a month old. The second set of photos were to mark Charlotte's six month milestone. The little princess is wearing two different outfits in this set of photos - one pink, the other blue. The pink liberty print dress has not yet been identified, but we recognize the m&h pink knit cardigan she wore for the Queen’s 90th birthday portrait. Her accessories include Condor pink ribbed tights ($13), Early Days Girls Navy Blue Leather 'Emma' Pre-Walker Shoe (£29) and pink small hair bow by Amaia Kids (£2.50). In one of the photos, Charlotte was holding The Wheels on the Bus sound and action book, and in another she was using the Walker and Alphabet Blocks by Pintoy. The blue dress is another m&h piece. The Spanish brand only has one stock photo showing it in pink. The cardigan is by Bristish brand, Olivier Baby. Charlotte is in the Princess Charlotte Cashmere Rose Stitch Cardigan in Cream (£59 – £89). The same style accessories were worn as the pink outfit, but in the blue colourway.